U.S. warplanes unleashed one of the most intense airstrikes of the Iraq war Thursday, dropping 40,000 pounds of explosives in a thunderous 10-minute onslaught on suspected al Qaeda in Iraq safe havens in Sunni farmlands south of Baghdad. CBS News correspondent Mark Strassmann was on the frontlines with the U.S. troops.He watched in real time from a tactical operation center as the bombs fell in what's called "Operation Marne Thunderbolt." It's the Third Infantry Division's assault against al Qaeda targets south of Baghdad, part of a nationwide U.S. offensive that began this week, Strassmann reports. The mighty barrage - recalling the Pentagon's "shock and awe" raids during the 2003 invasion - appeared to mark a significant escalation in a countrywide offensive launched this week to try to cripple remaining insurgent strongholds. But it also fits into the endgame strategy of last year's U.S. troop buildup, which seeks to regain control of Baghdad and surrounding areas as a buffer zone for the capital. U.S. commanders are now attempting to subdue the last insurgent footholds around Baghdad before the Pentagon faces a possible reduction in troop strength. Hours after the massive bombs fell, U.S. soldiers set foot in tough terrain outside Baghdad, an area where they haven't gone in a year. "The air strikes we saw today were about one kilometer from here," said Lt. Col. Mark Solomon. Strassmann asked him: "From where we are, how much further until we get into dicey territory?" "About 100 meters," Solomon said. The area's now secured, but it's not safe. When you walk around, it's only in the Bradley tank tracks, or the humvee tire tracks, Strassmann reports. 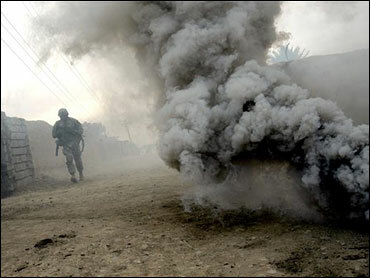 Anywhere else could be right on top of pressure-plate IEDs - a minefield left behind by insurgents. Some of the additional 30,000 troops have been pulled out and the remainder are expected to depart by June, military officials have told The Associated Press. With insurgents still holding pockets south of the capital in the north - including areas around the key northern city of Mosul - the military apparently wants to take the remaining four months or so to use the expanded military muscle against al Qaeda. After Thursday's fierce airstrikes, U.S. and Iraqi soldiers advanced through smoldering citrus groves into areas that were considered important al Qaeda enclaves around Arab Jabour, southeast of Baghdad. An Iraq officer said the soldiers discovered two houses used to torture kidnap victims and arrested at least 12 suspected insurgents. Little initial resistance was reported. At least nine American soldiers were killed since the offensive began Tuesday - the deadliest days for American forces since last fall. In the farming village of Zambaraniyah, on the outskirts of Arab Jabour about nine miles southeast of the capital, scenes of neglect and devastation were testimony to years of fighting between militants and U.S. and Iraqi troops. Most of the land is torched or left fallow along small roads that were once laced with booby traps and bombs. Fields are strewn with trash and the blackened hulks of cars. Many buildings are pockmarked by gunfire, and most homes are Maj. Alayne Conway, a spokeswoman for troops in central Iraq, said the amount of ordnance dropped in 10 minutes nearly exceeded what had been used in that region in any month since last June. Conway said the air attack "was one of the largest airstrikes since the onset of the war" in March 2003. A military statement said two B-1 bombers and four F-16 fighters hit 40 targets in Arab Jabour in 10 strikes. Al Qaeda fighters are believed to control Arab Jabour, a Sunni district lined with citrus groves. "Thirty-eight bombs were dropped within the first 10 minutes, with a total tonnage of 40,000 pounds," the statement said. The Iraqi army officer, whose unit is in the Arab Jabour area, said the airstrikes began at 8 a.m. and set several groves ablaze and destroyed two houses used by gunmen. He said soldiers confiscated documents and weapons including AK-47s. The army officer spoke on condition of anonymity because he was not authorized to speak to the media. But Sheik Mahmoud Kamil Shebib, a local Sunni leader who has turned against al-Qaida in Iraq, independently gave a similar account. Moahmoud Chiad, who lives on the edge of Arab Jabour, said he was surprised to see many U.S.-Iraqi checkpoints with Iraqi security forces. The Iraqis used loudspeakers to order residents to stay home. "After this, we saw U.S. helicopters hovering over the area while the sounds of jet fighters were also heard," he said. "Minutes later, there was the sounds of big explosions. We saw fire and smoke coming out from some groves. Then, the gunfire crackled in the groves, but it ended by noon." "This is about as far as our offensive has come to at this point," U.S. Army Lt. Col. Mark Solomon told a small group of reporters on a six-hour tour. A new study suggests 151,000 people have died of war-related violence in Iraq since the U.S.-led invasion of that country. The study, which will be published Thursday in the New England Journal of Medicine, is based on an extensive survey of Iraqi households. The work, a joint project of Iraq's Ministry of Health and the World Health Organization, is the latest attempt to try to quantify how many Iraqis have died because of war-related violence. An earlier study by researchers from Johns Hopkins Bloomberg School of Public Health pegged the number of deaths at more than 600,000. The United States announced on Thursday it has designated a Kurdish militant group as a terrorism threat to U.S. interests and blocked its assets. The Kurdistan Freedom Falcons, believed to be linked to the Kurdistan Workers' Party, or PKK rebels, has claimed responsibility for a series of bombings in Istanbul. The group is also known as the Kurdistan Freedom Hawks, or TAK by its Kurdish acronym. Two bombs exploded nearly simultaneously Wednesday morning near a military checkpoint in central Baghdad, killing two policemen and one soldier, police said. Eleven others were wounded in the attack, including four civilians.